The Hatsuko contemporary accent table collection brings a fresh outlook to your living room's design. 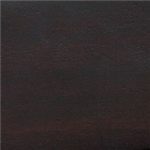 The dark rich finish over select veneers and hardwood solids complements the stylish look of the brushed nickel hardware and simple, clean lines of the block legs and framed panels. 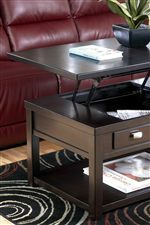 Open shelves, drawers on the end tables, and a lift top with interior storage on the cocktail table with caster wheels ensure these occasional tables provide functionality to your family room, den, or main living space. Browse other items in the Hatsuko collection from Beck's Furniture in the Sacramento, Rancho Cordova, Roseville, California area.